One of the consequences of tearing apart my kitchen was discovering that the plumbing in my house is effed. I expected that. What I did not expect was learning that the built-in cabinet in my kitchen was built there for a reason. It has false sides which conceal the main stack of the house, a secondary stack (whose purpose remains a mystery, it's right next to the other one), and the water supply to my bathroom. Seeing as these items would be in the middle of my future countertop, they all had to move. So basically, I have to re-do all the plumbing in my house. This weekend was spent removing about 800 pounds of cast iron pipe. This was often tricky because the bathroom waste pipes were embedded in the old concrete tile base under the bathroom floor, and less than an inch away from the water supply pipes. Especially fun was cutting the main stack in my attic. The stack was near the back of the house, where there was less than a foot of headroom in the crawlspace. Seven sawzall blades, many cuts and bruises, and enough cursing to offend most sailors later, I have liberated my abode from the old plumbing. Now, of course, I have to put in the new, but installing a bunch of PVC is a breeze compared to what I went through. I went on my roof for the first time yesterday as part of this process, since I had to get rid of the two old stacks and patch the holes. I was a bit nervous about this since I fully expected my roof to be in awful shape, but was pleasantly surprised to find it was actually looking pretty damn good. That makes it the about only thing in my house that is NOT a mess. I was also treated to this spectacular view of Petworth, facing northeast from my house. 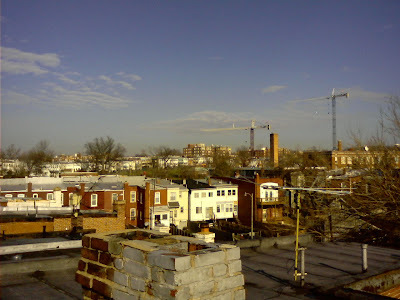 The two cranes are at the construction site by the Georgia Avenue/Petworth Metro. I love the American flags flying at the top of the cranes. This is a cell phone picture so it's not the best, but if you enlarge it -- just click on it -- you can make them out. New Hampshire primary miscount scandal? Not!